There is no denying that the election of Donald Trump as next President of the United States has dealt a huge blow to the immigration reform effort and diminished any hope for the passage of broader legal immigration reform. We had hoped that with the election of Hillary Clinton we would see an increase in immigration levels for highly skilled workers, as well as increased visa opportunities for entrepreneurs and investors. While the news of Donald Trump’s election was a big setback for immigration in general, polling continues to suggest that people across the United States are willing to support fairness in dealing with the undocumented immigrant population in a sensible and human way. By contrast, most Americans disapprove of passing broad legal immigration reform that would benefit foreign workers. Donald Trump was able to win the favor of a great number of Americans because of his critical view of programs like NAFTA that he believes has allowed American jobs to go overseas. Trump has blamed the U.S. government for allowing programs like the H-1B worker program to exist, saying that foreign workers are taking American jobs. We can expect to see Donald Trump take a restrictive view on legal immigration, keeping immigration levels within historic norms. Donald Trump has until recently softened his tone on illegal immigration, claiming that his priority is to deport only dangerous criminals residing in the United States unlawfully, although his 10-point plan contradicts his recent stance. It is likely that the Republican House and the Senate will introduce legislation designed to benefit American workers and the economy, and focus less on creating immigration opportunities for foreign workers. Similarly, the Trump administration will likely focus on job creation, and less on passing any meaningful legal immigration reform. The program that may come under fire by the Trump administration is the Deferred Action for Childhood Arrivals (DACA) initiative which began on June 15, 2012 as part of an executive order introduced by President Barack Obama. Donald Trump has repeatedly said that he wants to end the Deferred Action for Childhood Arrivals (DACA) program incorrectly calling it an “amnesty.” In actuality, DACA is not amnesty and does not provide a pathway to permanent residency or even citizenship. DACA merely shields the individual from deportation and allows them to legally obtain employment in the United States for a temporary period of time. Although Donald Trump has vowed to end DACA, we still do not know if or when DACA might end. 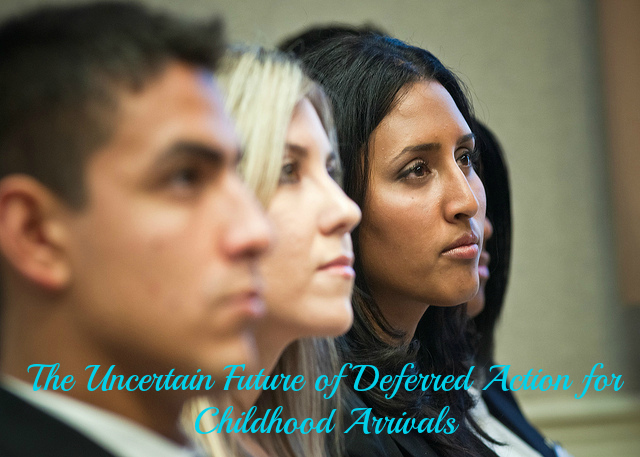 In the worst case USCIS might stop accepting or approving DACA petitions, or alter the program. We do not anticipate that persons who have already applied for and received DACA will be affected by any changes in the law when Donald Trump is inaugurated on January 20, 2017. It would be very unlikely if this were to happen. As of June 30, 2016 it is estimated that USCIS has approved approximately 750,000 DACA applications and in excess of 525,000 DACA renewals since the program began in 2012. Given the number of people that would be affected, should Donald Trump pursue an end to the DACA program, we anticipate that the Trump administration and U.S. government will be under enormous pressure from pro-immigration advocates, immigration organizations, immigration attorneys, states themselves, and the undocumented immigrant population to refrain from ending the DACA program. The American Civil Liberties Union (ACLU), local law enforcement agencies like the LAPD, and the American Immigration Lawyers Association (AILA) have already voiced their concerns. The LAPD police chief has stated that the LAPD will not be cooperating with ICE or Border Patrol in the apprehension and/or detention of undocumented immigrants. In other words, we will not see the end of the DACA program without a fight, and it will certainly not happen overnight. If you are concerned about whether or not you should file for DACA benefits, or renew your current DACA status before Donald Trump takes office, it is recommended that you contact our office or an attorney near you as soon as possible to discuss your individual case, and determine whether or not you qualify for other more secure immigration benefits. Please note that if this will be your first time applying for DACA, the application will not be approved before Donald Trump takes office in January. There is still time to file a renewal application and receive an approval before January. Many of our readers are asking whether the information they have or will provide on the DACA application will be given to any other agencies for the purpose of immigration enforcement. Our opinion is that applicants who are eligible, but who have not yet filed a DACA application, should consider the risks of filing an application very carefully, given the uncertain immigration climate. Applicants must keep in mind that there are no statutory or regulatory provisions that can ensure that their information will be protected once submitted. In addition, there are no guarantees that the information will not come into the hands of a law enforcement official for immigration enforcement purposes. Generally speaking the information provided in the DACA applications is protected from disclosure to ICE and CBP, except when the requestor is eligible to receive a Notice to Appear before immigration court or where the court has recommended the information to be forwarded to ICE. Once the applicant receives their “deferred status” pursuant to DACA the information provided is not referred to ICE. Information provided may always be shared with the national security and law enforcement agencies including ICE and CBP for purposes other than removal, for assistance in the consideration of DACA, to identify or prevent fraudulent claims, for national security purposes, or for the investigation or prosecution of a criminal offense. In summary, the information provided in a DACA application may be shared with ICE and CBP for immigration enforcement purposes only if the requestor meets the criteria for NTA issuance, but information may be shared with other law enforcement agencies (including ICE and CBP) for purposes other than removal. “Other purposes” may include identifying and preventing fraud, national security concerns, and the investigation or prosecution of criminal offenses. USCIS reserves the right to modify, supersede, or rescind this policy at any time without notice, therefore individuals should carefully consider the risks of disclosing their personal information to USCIS. Individuals filing a DACA application for the first time might increase their exposure to enforcement actions once Trump takes office. Please consider the risk very carefully, and before taking any decisions please speak with an attorney to fully discuss your situation. For more information on the services we provide please contact our office.